Chef Curtis Stone Hosts #MoreFarmers at Maude Restaurant Beverly Hills. 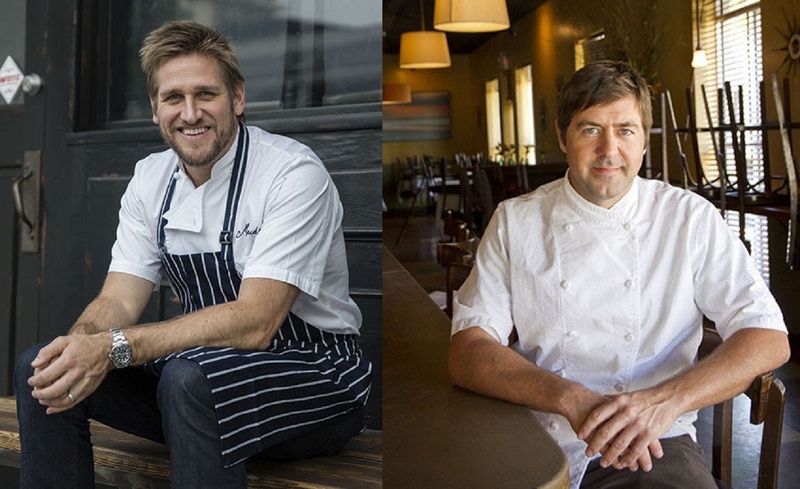 Chef Curtis Stone will host Chef Mike Lata (FIG Restaurant and The Ordinary, Charleston) at Maude Restaurant in Beverly Hills for a one-night-only special guest-chef fundraiser dinner to benefit the National Young Farmers Coalition (NYFC) on Saturday, February 27, 2016. The 12-course dinner will feature six dishes from each chef, inspired by potatoes – February’s headlining ingredient at Maude. This inaugural guest chef dinner at Maude serves as the first in a series that Chef Stone will host throughout 2016 to benefit NYFC. Tickets for this #MoreFarmers dinner are available now through Maude’s reservation system for $375 per seat, which includes wine pairing. Pictured left to right: Chef Curtis Stone, Chef Mike Lata. The National Young Farmers Coalition’s goal is to help the next generation of farmers to enter the field by adding 25,000 new farmers to American agriculture by 2022. Currently, only six percent of farmers are under the age of 35. The organization was founded in 2010 by a group of young farmers who realized that they and their peers were facing huge challenges: difficulty securing loans, lack of access to affordable farmland, and student debt. They decided to build a national coalition of farmers, ranchers, and consumers to represent and mobilize the next generation of farmers. After learning the facts about the future of the farming industry, Chef Curtis Stone was inspired to dedicate time and resources to raise awareness and funds for NYFC. Through this 2016 guest-chef dinner series, he will host some of the industry’s leading chefs who share his sense of urgency in ensuring that our farmers of the future can thrive. Two thirds of all farmland will transition ownership over the next 25 years, and without a new generation of farmers to take over ownership and management of America’s family farms, farmland will likely be sold to investors and developers, consolidated and managed by large corporations, or fall out of production altogether. As a result, consumers will have fewer choices about the food they buy, and how it is grown, and our food system as a whole will be more vulnerable. The next generation is interested in farming, but there are a number of barriers that stand in their way. The February 27th dinner will focus on one of the crucial issues that has kept future farmers and ranchers from entering agriculture: student loan debt. Graduating from college with debt, future farmers are finding that they either cannot afford to farm while paying down their loans, or that they are prevented from leveraging capital to start and grow a farming business. Fortunately, the Public Service Loan Forgiveness Program was created in 2007 to help people enter professions that provide a public good, but offer salaries too limited to manage student loan debt. Currently, this program covers teachers, nurses, doctors, public interest attorneys, government employees and non-profit professionals. The National Young Farmers Coalition is asking Congress to pass legislation that adds farming to the list of professions covered by the program. To learn more about the National Young Farmers Coalition and their efforts to ensure that we have #MoreFarmers, go to www.YoungFarmers.org.